business books, current events, work, money, and more. Boeing still does not know how the crisis over the safety of its 737 Max jets will hit its financial performance. The government is using a recruitment firm for the first time suggesting it is broadening its search. Full-year borrowing was still higher than the government's independent forecaster expected. An employee leaves and you post the open position. Resumes trickle in. You interview a few candidates. No one fits the bill. The next thing you know, three months have passed and that desk is still empty . . . Nothing drives business success like a staff of talented, productive employees. So why accept a hiring process that fails you time and time again? Well, there’s one person who doesn’t: Scott Wintrip. 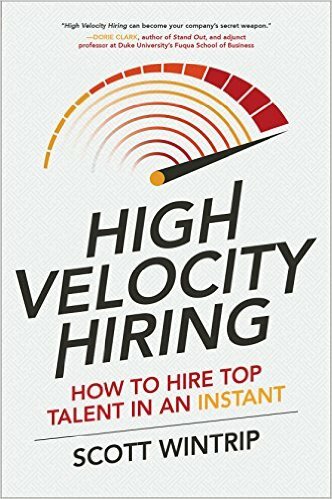 And in High-Velocity Hiring, he provides the tools and systems for creating a hiring process designed for today’s fast-paced, talent-deficient landscape. Using the proven methods Wintrip has applied at some of today’s more forward-thinking companies, you’ll hire top employees faster―and smarter. High-Velocity Hiring replaces the old, worn-out way of hiring with the simple but revolutionary approach of actively cultivating top talent before positions open. The old way is slow and inefficient. Wintrip’s way is dynamic and proven-effective. You’ll enrich and maintain a flow of high-quality candidates, harness this flow by identifying the most talented people, and channel it into a pool of ready-to-hire prospective employees. More than ever, hiring the best people requires foresight, planning, alertness, and decisive action. With High-Velocity Hiring, you have everything you need to seize the high-ground in the war for talent and maintain it for long-term growth and profitability.